About 10,000 residential building attic fires are reported to U.S. fire departments annually, causing about 30 deaths, 125 injuries, and $477 million in property loss, according to the U.S. Fire Administration. Despite the fact that attic fires only comprise two percent of all residential fires, they can cause extensive destruction very quickly. Most attics, because they are typically unfinished, don’t contain smoke alarms, so occupants are unaware of the fire and smoke until it descends into the lower levels or as it rises from the roof to alert neighbors. 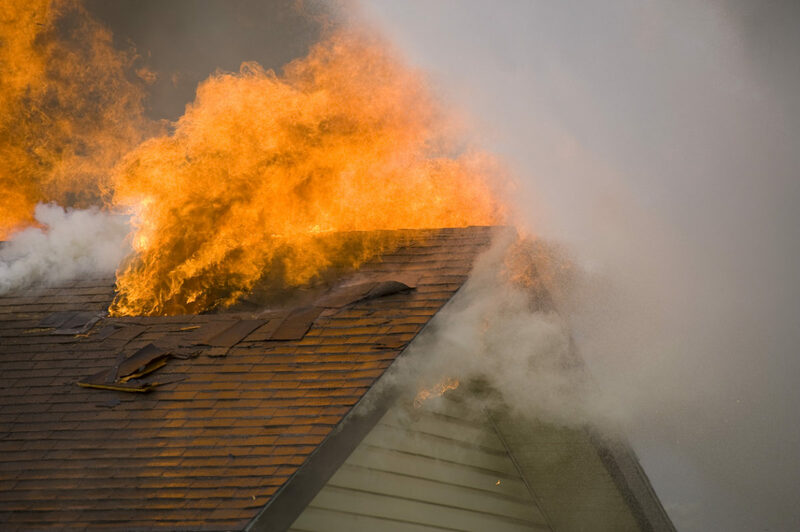 Why are roof fires originating in the attic dangerous? There are many materials in the immediate area that can easily feed the fire, such as wood support beams, boxes of clothing, holiday decorations, or other dry, flammable items. Once the fire starts, it tends to grow in size and strength very quickly. They’re harder to extinguish due to the location, and often bring about more damage to the home. Follow these maintenance guidelines to prevent roof fires. Electrical malfunctions are a top cause of attic fires. Always have an electrician examine your attic wiring, particularly if your home is very old. Having wiring that is up to code will ensure your family’s safety. There’s a lot of dust and debris that builds up inside your chimney. Have a professional clean out your chimney annually, particularly if you frequently use your fireplace. Remove organic material from the chimney to reduce the chances of debris igniting. If you will be facing a roof replacement project in the near future, consider using fire-resistant roofing materials so you can reduce the chances of property loss due to fire. There are many contributing factors to roof fires, from faulty wiring to improperly installed ceiling insulation. Let’s now take a look at the top five causes of roof fires. Ceiling insulation, not caused by the insulation itself but with how it was installed or how electrical cabling was installed. The heat emanating from vent pipes deteriorates the roofing material over time, igniting a fire when coupled with high winds. Leaky roof, which can cause electrical wirings in the ceiling or attic to malfunction or result in wire shorting issues. Roofing materials that are sub-par. Always look for an A rating, as that is the most fire-resistant material. Metal tiles or sheets are good choices. Roof materials may also have an A rating if they are coated with fire retardants. Dirty chimney. Smoke from the fireplace creates a layer of flammable material that coats the interior of your chimney. Have your chimney cleaned regularly to remove this coating. Preventing roof fires starts with proper installation of the best materials. If you would like a quote and consultation on a new roof or roof repair, contact us today at 817-532-5244. Remember, Fire Prevention Week is October 7-13!